Don’t be fooled by the name. Food Network-featured Manci’s Antique Club is a man-cave if I’ve ever seen one. (Which is handy, because I suggested we try it as the lone woman in a party of 8.) Lined with old farm machinery and a Jim Beam collection that rivals the moonshiner himself, this bar/dive is something. I have it on good authority that males will love this place… Especially if they decide to man-up with the Hurricane Burger! 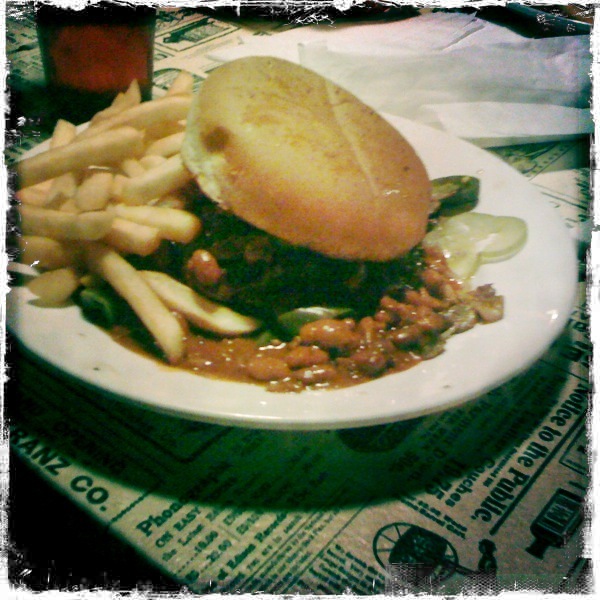 A bacon-cheese burger slopped with chili? C’mon, you know you boys would wear bacon-chili cologne if they made it. Gals, this is not Dr. Pepper 10. There are plenty of treats for us as well. (And I’m not talking about the bathroom. Wink, wink.) I sampled a few of the sandwiches, but I especially like the sides: homemade chips, fries, or (yessss!) fried okra. This sounds like an adventure! Great descriptions.